Ehsaan was raised in an environment that inculcated the appreciation for various genres of music right from an early age. And before one knew it, young Ehsaan was bitten by the musical bug! He soon began learning the guitar under the expert tutelage of Bismarck Rodriguez in Mumbai at the age of 14. Ehsaan attended GIT (The Guitar Institute of Technology as it was then known, now known simply as “MI”) between March 1985 and 1986. This period proved to be the turning point of his musicianship as he gradually began to develop into a guitarist of immense potential. Admittedly, it was a steep learning curve that egged him onto push beyond the realms of his known abilities. He has fond memories of this period and often refers to it as “the best year of my life” Being in Los Angeles, often referred to as the Music Capital of the World, exposed him to great musicians like Robben Ford, Larry Carlton and many other great artists of varying repute. This was a year of redoubtable growth for Ehsaan which helped both his improvisation and composition skills. After being influenced by popular bands of the 1970s like Led Zeppelin, Pink Floyd, Deep Purple, Wishbone Ash and Santana; Ehsaan developed a strong inclination and affection for the Blues. There was something about the genre that caught his fancy then and continues to hold him in thrall even today! Listening to players like Johnny Winter, BB King, Eric Clapton and Robben Ford helped him build a blues vocabulary, which was his stepping-stone to improvisation. The 80s saw Ehsaan’s musical tastes being strongly influenced by bands like The Police, Level 42, Go West, Mr. Mister who burst onto the scene with their produced sound, complex structures and melodic hooks. 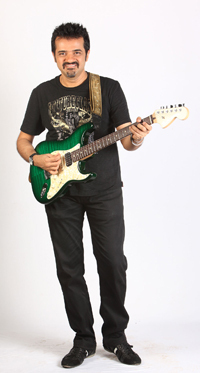 Ehsaan cites his guitar influences as mainly Robben Ford, BB King, Larry Carlton, Andy Summers, Andy Powell, Laurie Wisefield, Eric Clapton and Michael Landau. It was these varied influences that moulded his perceptible musical sensibilities and helped him develop a keener understanding of different genres – something that continues to hold him in good stead! On his return to India, Ehsaan was drawn into the studio scene working with composers like Louiz Banks for numerous advertising commercials. He continued to make waves in the industry with his catchy tunes, musical brilliance and expert guitarmanship. This soon led to Ehsaan composing music for commercials. And before one knew it, Ehsaan was soon brainstorming with Shankar Mahadevan and Loy Mendonsa. The three came together to compose music for films…SEL was born and the rest is history! Composing for commercials and films helped Ehsaan experiment with many different styles of music – blues, rock, country, electronic or metal but his heart still lay and continues to lie with the Blues (he still performs with his current band “Apostrophe”)!